My in-laws use yogurt regularly in their Indian cooking, and sometimes my mother-in-law makes her own. Several years ago, she showed me how she makes it, and she gave me some of hers to use as a starter. Her method is essentially to boil the milk (always whole milk) for a while, then cool a bit, add the starter (which I believe she purchases at the Indian grocery store), and then place in a glass/ceramic container in an unheated oven until it is cultured. I tried this, but I didn’t love the result, and I felt that it was too unpredictable: what temperature do I heat and cool to? What if my oven isn’t warm enough? What if the yogurt doesn’t set? And most importantly, what if I don’t like the way it tastes? Truth be told, homemade yogurt often tastes richer and more flavorful than the store-bought variety. It can certainly be tangier depending on how long you let it culture, and it will probably not have the same texture as store-bought since you are not adding any gums or stabilizers (or draining the whey) to make it thicker. But it felt like a daunting process and at the time, B and I just didn’t consume enough yogurt to make it worthwhile. Fast forward to the present when my kids eat yogurt on a regular basis, and I enjoy it from time to time as well. I saw a recipe that made yogurt in a crockpot and made it seem so simple that I thought I should give it a try. And you know what? It worked, and my kids liked my homemade yogurt better than the stuff I’d been buying at the store! The benefits of eating yogurt have been publicized more and more over the past decade, but people have been fermenting milk for much longer than that and reaping the benefits of improved digestive health all the while. The fermentation of any food increases its digestibility by breaking down sugars and compounds within the food that can be difficult for the body to process. It also increases the beneficial bacteria in the food, which leads to better digestion as well as improved immune health by keeping harmful gut bacteria in check. Fermenting, or culturing, milk reduces the amount of lactose (so that people who are lactose-intolerant may be able to digest yogurt with fewer issues) and uses multiplying beneficial bacterial to create a thick, creamy consistency. The longer you ferment milk, the more lactose will be consumed and the more bacteria will be able to replicate, which is why a longer fermentation time will result in a tangier yogurt. You will still get the benefits of yogurt with shorter culture times, but if you’re looking for a more nutritious food, a longer fermentation will provide you with more of the good bugs. 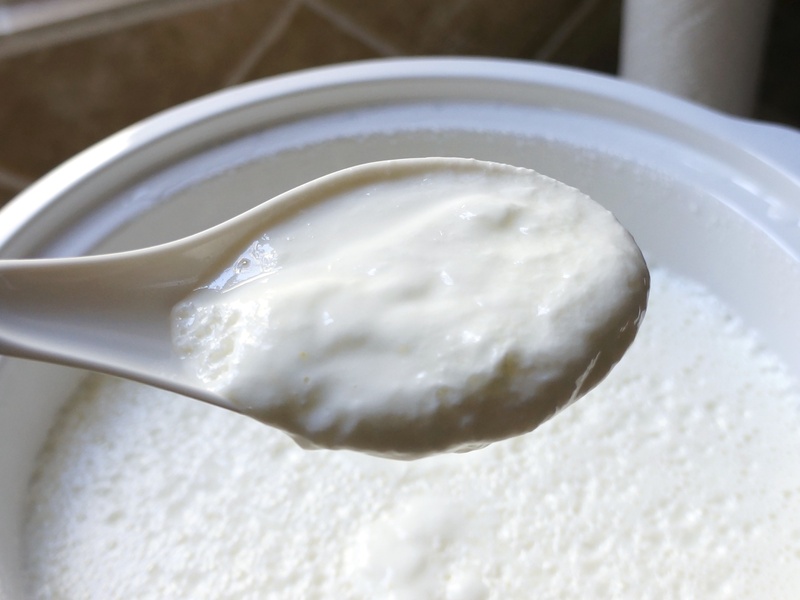 I’ve been making yogurt for about six months now, and I’ve tried several types of milk and two sizes of crockpots to see what I like best and what works for me and my family. My method varies a bit from the one in the recipe I originally consulted, but it has consistently produced creamy, flavorful yogurt. It is really quite easy! One of the things I love most about yogurt is its versatility. My kids and I eat it with fresh fruit and/or grain-free granola. They also like it with cinnamon. I use it in smoothies and as a substitute for sour cream. And there are many, many ways to use it in Indian cooking. I’ll be sure to post some of those recipes in the future! Why do I make yogurt? There are two main reasons that I have been, and will continue to, make my own yogurt. It is far cheaper than buying it at the store. The yogurt I used to buy (Trader Joe’s European Style Organic Plain Whole Milk Yogurt) costs $2.99 per 32oz. container. I typically bought two containers each week for a total of $5.98 for 64 oz. of yogurt. If I buy the equivalent quality of milk (organic, whole, pasteurized, homogenized), it costs roughly $6 for a gallon (which is 128 oz.). Better quality milk will be more expensive, but if I want to stick with the same quality as that which is available at the stores I frequent, I can reduce my yogurt bill by half just by making it myself. I can control the quality of the milk I purchase, and therefore the quality of the yogurt I make from it. I prefer to buy this organic, grass-fed milk since it comes from grass-fed cows and is not homogenized. However, it is not always available to me, and it can be quite expensive (about $5.69 per half gallon/64 oz.). It is also very difficult to find yogurt made from non-homogenized milk from grass-fed cows, and the one brand that is semi-available to me is quite expensive. So, if I buy the best quality milk I can find, making the same amount of yogurt will cost between $5-6–the same as buying the Trader Joe’s yogurt or a similar equivalent. If I buy a lower quality milk, then the cost only goes down. 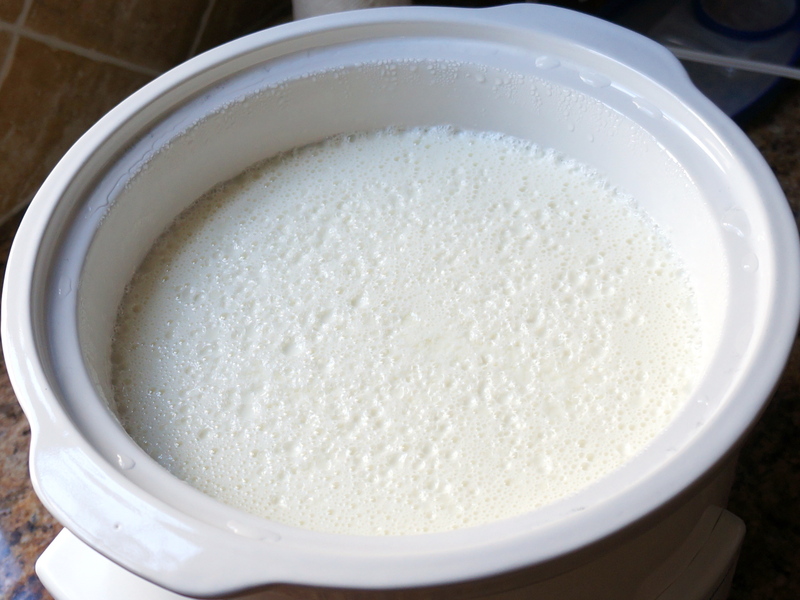 Pour milk into your crockpot, cover with the lid and turn on high. You want to heat the milk until it reaches a temperature of 180F. This will take 2-3 hours. I typically set a timer for two hours, then stir the milk and insert a probe thermometer that is set to alert me when the temperature reaches 180F. That way, I can go about my day and not have to hover over the crockpot waiting for it to reach the correct temperature. 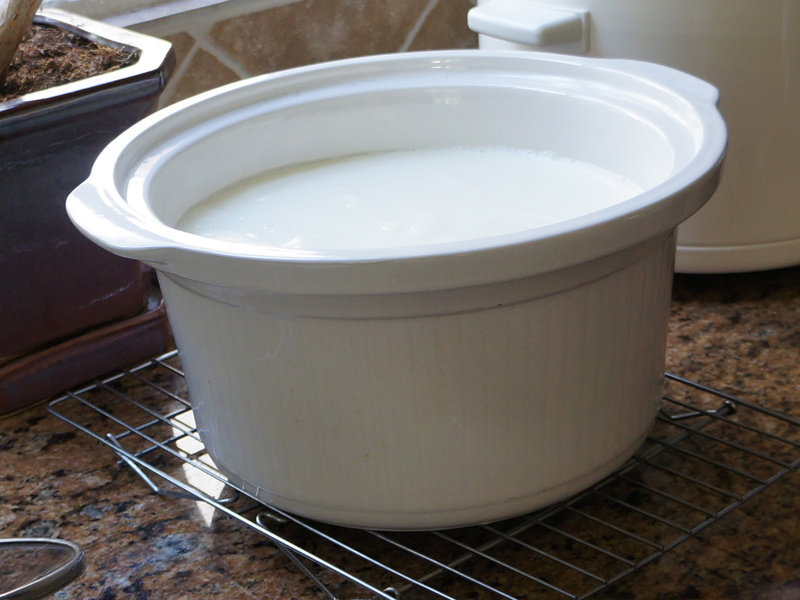 Once the milk reaches a temperature of 180F, turn off the crockpot (and unplug it) and remove the ceramic insert to let the milk cool to 110F. You can either place it on a rack to improve air flow or place it in a large bowl of ice water. The second method is faster, but you will need to stir the milk often to make sure it cools at an even temperature (otherwise, the lower half will cool too fast and the top will still be hot). This can take anywhere from 15 minutes to an hour depending on the cooling method you choose and how much milk you heated. While the milk is cooling, get the starter out of the refrigerator and let it come to room temperature. I spoon out 1-2 Tbsp. per 4 cups of milk and place it in a small bowl. 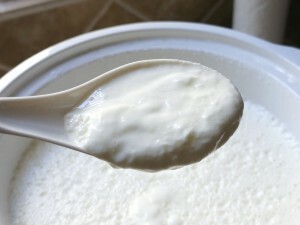 When the milk has reached 110F, gently add a few spoonfuls into the bowl of starter yogurt and mix it in. 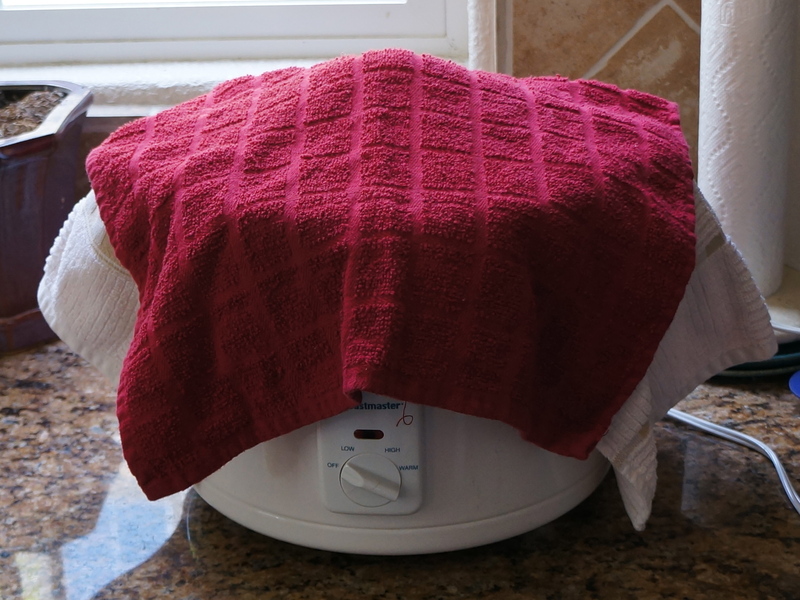 Then add the starter to the milk (stir or whisk well), put the ceramic insert back into the crockpot, cover with the lid, and then cover everything with two clean towels. 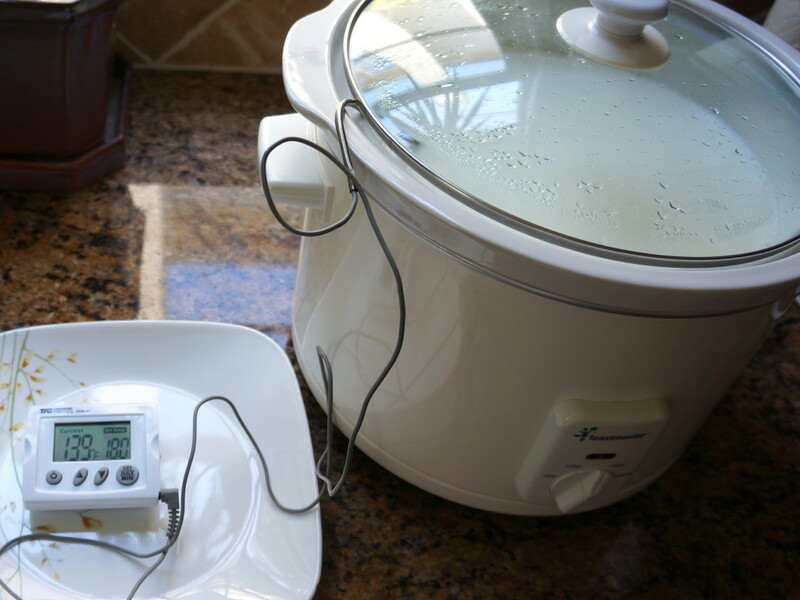 You want to insulate the crockpot and keep the culturing milk as close to 110F as possible. Place the crockpot in a warm place in your kitchen where you can leave it undisturbed for at least 6-12 hours (and up to 18-20). You’ll know it is done when you can gently shake the ceramic crockpot insert and the contents “jiggle.” You can also taste it for tanginess, but the flavor and texture will improve after refrigeration. After the milk has cultured, transfer it to glass containers and refrigerate for a few hours to stop the fermentation and let it set. I like to use mason jars with plastic lids since they fit well in my refrigerator. The size/shape of your containers is up to you. It will be delicious, but it probably won’t taste or feel just like store-bought. If you let it culture longer, it will be tangier. It might be slightly lumpy (mine usually is). It might be thinner. But it will be delicious, and it will be better for you since it was cultured for long enough to get those beneficial bacteria multiplying. If you’re used to flavored yogurt (which is usually low-fat as well), eating plain, whole milk yogurt may take some getting used to. You can certainly sweeten your homemade yogurt with vanilla, maple syrup, or honey, but I find that fresh fruit works just as well. Any yogurt you make at home will be better for you than a store-bought artificially or naturally flavored, sweeteened, artificially colored version. I usually start the process in the morning and then let the yogurt culture all day. You can also start it in the afternoon/evening and let it culture overnight, but it may take a bit longer since the temperature in your kitchen will probably be cooler at night. I’ve included temperatures and approximate times for the culturing process, but these are guidelines. If your milk is a few degrees off, don’t worry: it will still culture. 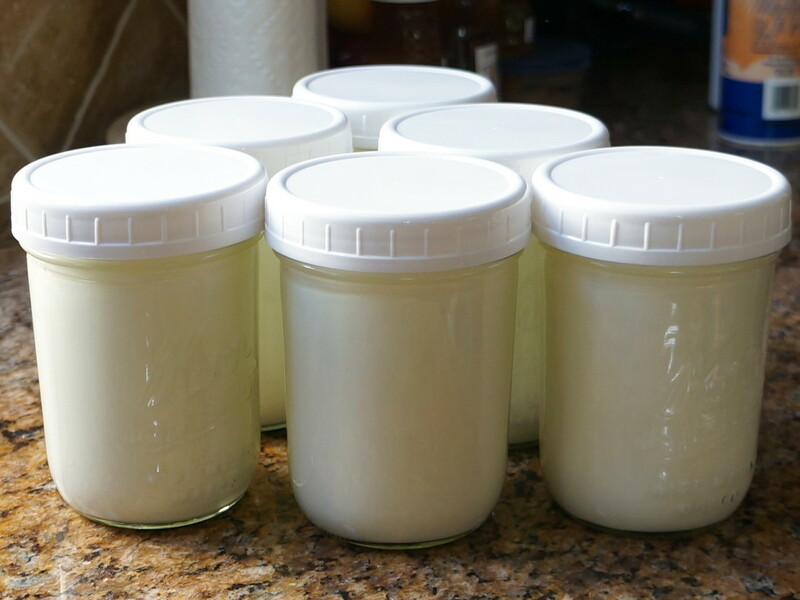 If your yogurt turns out tangier than you like, adjust the length of fermentation the next time around. If it still doesn’t turn out the way you like it, you can start over with new milk and a new starter. In the six months since I have been making yogurt, I have bought yogurt only once to restart (and that was after maybe four months of using starter yogurt from previous batches). 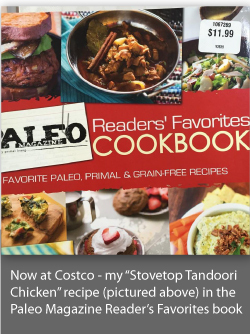 This post is linked to Tasty Traditions and The Paleo Rodeo. I’m looking forward to trying this one. Thanks Rebekah!! 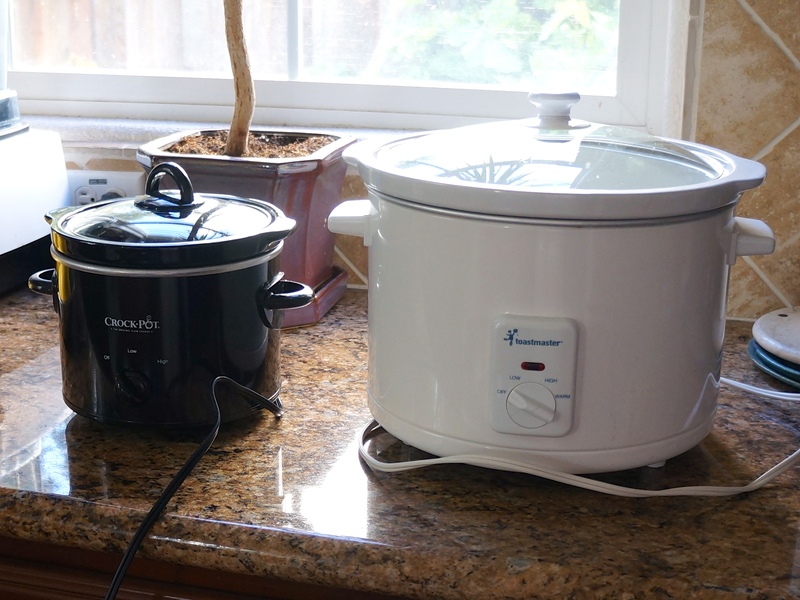 The crockpot makes it really easy! I hope it turns out well for you :).